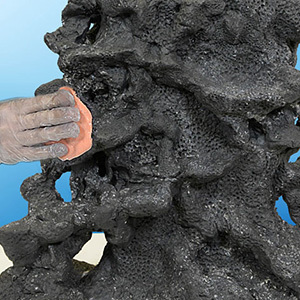 After mixing, Free Form® AIR can be pressed into a mold to make a lightweight, detailed casting. 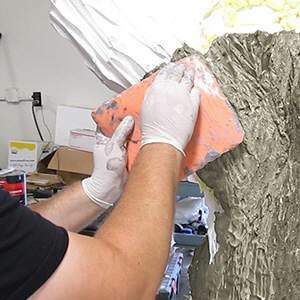 It will hold vertical surfaces and can be applied to almost any surface including polystyrene foam for rough sculpting. Free Form® putty can also be used to make rigid support shells or mother molds. - Thickness; 1.5 inch (3.81 cm) – pot life is 30 minutes, handling time is 2.5 hours, full cure in 24 hours. - Thickness; 3/8” (0.95 cm) – pot life is 60 minutes, handling time is 4 hours, full cure in 24 hours. 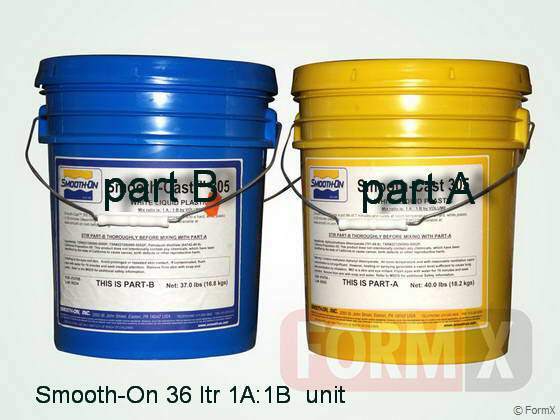 - Thickness; 1/8” (0.32 cm) - pot life is 120 minutes; handling time is 8 hours, full cure in 24 hours. 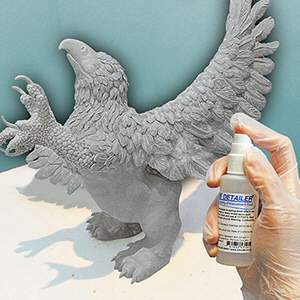 Free Form® Habitat® Black Epoxy Putty is a mix-by-hand putty that is used to create textured or highly detailed display pieces. Habitat® Black is solvent-free and contains no VOC's. Working time is 60 minutes and cure time is 16 hours at room temperature at 73°F / 23°C. Epoxy cures to a very hard, heat resistant material that is easily painted. Use with Habitat® Folding Powder – fold powder into epoxy putty to thicken and reduce sag when applied to a vertical surface. Folding Powder also reduces stickiness and makes the epoxy more handle-able. 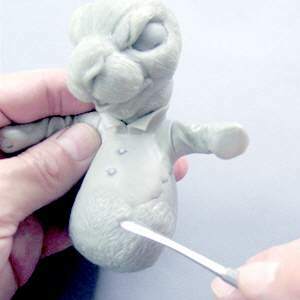 Once putty is applied, it can be stamped with a silicone rubber stamp to create repeating patterns with intricate detail over a large surface area. Surface can be smoothed with alcohol or water. New Habitat® Black will bond to cured Habitat® Black without delamination. Habitat® Black will not melt foam, and can be used as an EPS foam coating. Habitat® Black is suitable for interior and exterior use. It is certified "aquarium safe" and used by aquariums to create hyperrealistic coral and other aquarium displays. Habitat® Black is also used for general sculpting and theming applications. Free Form® Habitat® Black is also an excellent repair cement and bonds permanently to itself, PVC, acrylic sheeting, wood, many metals, plastics and foams. Free Form® Habitat® Fire Safe epoxy putty is a high density epoxy sculpting putty that is flame rated (E84, Class A). Habitat® Fire Safe is solvent-free and contains no VOCs. Working time is 90 minutes and cure time is 16 hours at room temperature (73°F/23°C). Epoxy cures to a very hard, flame and heat resistant material that is easily painted. Fire Safe does not contain any carcinogens (cancer causing agents). Free Form® Habitat® Fire Safe is suitable for interior and exterior theming applications and general sculpting. It is also certified 'aquarium safe' and is used by aquariums and zoos to make hyper-realistic trees, vines, rocks, coral and other display elements. Once putty is applied, it can be stamped with a silicone rubber stamp to create repeating patterns with intricate detail over a large surface area. Surface can be smoothed with alcohol or water. New Habitat® Fire Safe will bond to cured Habitat® Fire Safe without delamination. Habitat® Fire Safe will not melt foam, and can be used as an EPS foam coating. Free Form® Habitat® Fire Safe is also an excellent repair cement and bonds permanently to itself, PVC, acrylic sheeting, wood, many metals, plastics and foams. is a low viscosity liquid that makes adding details and detail effects to the surface of Free Form Sculpt® Epoxy Putty easy. Bottle/spray 30 ml. 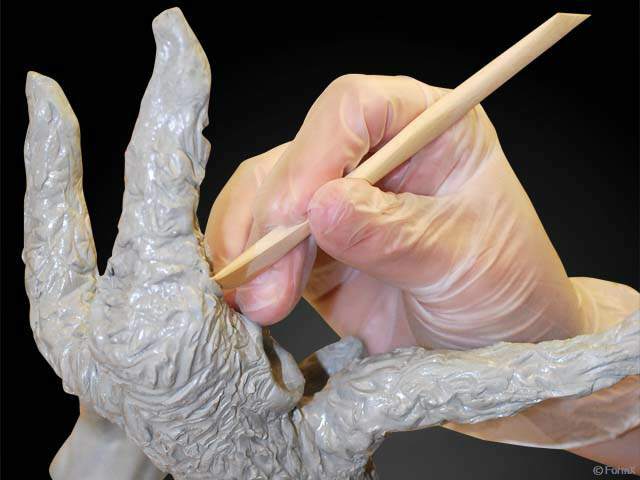 is a low viscosity liquid that makes adding details and detail effects to the surface of Free Form Sculpt® Epoxy Putty easy. Bottle 362 grams.